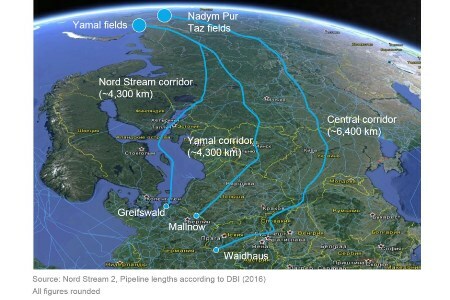 The public hearing on the Nord Stream 2 pipeline project in Germany will take place from 17 - 21July 2017 under the direction of the relevant permitting authorities – the Federal German Maritime and Hydrographic Agency and the Mining Authority Stralsund. "Nord Stream 2 to strengthen security of supply in the European Union"
The public hearing is an important part of the German permitting procedure and at the same time represents the final phase of the public participation for Nord Stream 2 in Germany. During the five days of the hearing, permitting authorities and interest groups will debate the objections and statements submitted concerning the project. This includes the purported lack of need for an additional pipeline, which has been the main point of criticism brought forward by environmental organisations. Europe’s domestic gas production has steadily declined during the past years. Over the next two decades, it will further decrease by approximately 50%, or around 70 billion m3. On the other hand, traditional suppliers such as Norway (-25 billion m3) and North Africa (-30 billion m3) will not be able to maintain current supply levels. At the same time, gas demand in the European Union will remain stable, as forecast, for instance, in the EU Reference Scenario 2016. This means that additional infrastructure is necessary to fill the resulting import gap of about 120 billion m3 and secure Europe’s energy supply against supply-side and demand-side risks, also in the shorter term, up to 2020. The import gap will be filled both by LNG and piped gas from Russia, and the respective share of imports will be set by the market. As Nord Stream 2 can provide only a part of the requirement for additional gas imports, the current share of one third of EU energy supply will not change significantly. The 55 billion m3 of gas that Nord Stream 2 will have the capacity to transport could save about 160 million t – or 14% - of the EU’s total CO2 emissions from power generation, if the gas were to be used instead of coal. In combination with power from renewables, natural gas has a number of advantages over other fossil fuels, making it the first choice as an additional energy source in an enhanced low carbon energy strategy. In the EU, gas is expanding its share in the power generation mix and is projected to overtake coal in about 10 years.